"Harbor Homes built our home and the construction is immaculate," said Channer. "My father and wife were in the construction business, so we have some knowledge of how things should be done. We bought it while it was being framed and everything is as it should be. They paid great attention to detail, joints and the quality of lumber. I can�t speak highly enough of Harbor Homes." Working for Boeing, moving to Charleston and buying a Harbor home in The Ponds has worked out well for the Channer family. "For once, we actually feel we have done the right thing," Channer remarked. "The Southern hospitality and the people who take pride and ownership of the Lowcountry are things you don�t see often. Charleston people have been absolutely phenomenal, and we love educating our daughter about all of the local sites." "I became familiar with Charleston way back in the early 1980s when guys in the service talked about wanting to retire here," said Channer. "I was in Charleston all the time for staging or presidential support, but I didn�t get to explore much. Now I understand why so many of the guys wanted to stay. It�s neat to see how much the city has changed since I first came here." 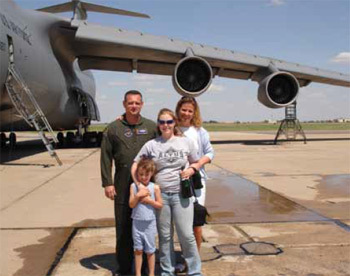 For the first decade of his Air Force career, Channer flew B-52 bombers, then spent the next 20 years on the C-5A Galaxy, a large military transport plane. He is now enjoying his retirement from the military working with the Lowcountry�s newest and largest industrial employer, The Boeing Company. As a skills advisor, he helps train new employees, as well as those already on the job. "I have handled and flown Boeing products for 30 years while in the Air Force, so it�s great to continue working with such an outstanding product," Channer explained. Originally from Cincinnati, Channer�s most recent assignment was in Huntsville, Alabama, which is similar in some ways to Charleston but vastly different in others. "Some of the biggest differences are the trees, infrastructure and traffic. Charleston is definitely more bustling and it has a heritage to it," he said. "But the people are the same. There are good people in both places. We couldn�t ask for anything more." Once they decided to move to the Lowcountry, Channer and his wife, the parents of four children, knew they wanted to find a home that was part of a community. They searched several locations and even offered a contract on a house before they discovered The Ponds. The community in Summerville just felt right to them. "Our first visit was breathtaking," Channer explained. "It just felt right. My wife and I agreed and even our 10-year-old daughter agreed that this was it. It was all the good things you remember from growing up and none of the bad. Every day I walk out of my home, and it fascinates me." It didn�t take long for the Channer family to make a decision. The day they visited The Ponds, they told their agent they wanted out of their current contract. "The Ponds is an extraordinary community. It is magnificent and we are very pleased. We haven�t been let down," Channer said. The Ponds boasts a host of amenities and five top-notch builders in a historic setting.